Flavia’s had a hell of a year, finding murdered bodies everywhere from her own garden to the church crypt. She’s met ageing philatelists, ciné folk, fortune tellers, puppeteers, and a flora-archaeologist, all while dealing with being the youngest sister in a family whose mother disappeared when Flavia was only a baby. “She stuck out a pale hand and touched each of them in turn on the forearm. As she turned her head Flavia-wards, she gave me such a glare! 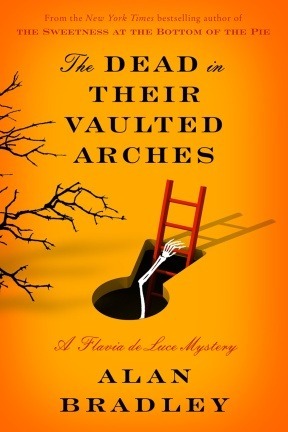 The Dead in their Vaulted Arches is a tough book to review without giving too much away. Book five, Speaking from Among the Bones, ended with a major cliffhanger, and this book picks up with a serious plot reveal. Forgive my vagueness, then: I don’t want to ruin the emotional impact for you with spoilers. Within the first chapter, I gasped several times in surprise. 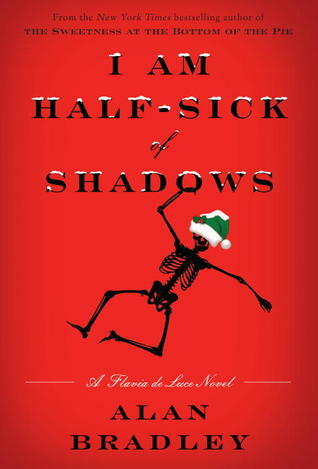 In the sixth installment of the wonderfully entertaining Flavia de Luce mysteries by Alan Bradley, our heroine Flavia is now nearly twelve. She’s had a hell of a year, finding murdered bodies everywhere from her own garden to the church crypt. She’s met ageing philatelists, ciné folk, fortune tellers, puppeteers, and a flora-archaeologist, all while dealing with being the youngest sister in a family whose mother disappeared when Flavia was only a baby. Old questions are going to be answered in this book, but there’s still plenty of juicy mystery. Who is the young man who gives Flavia a garbled message and then winds up dead beneath the train? Why is Winston Churchill there, and what is his cryptic message to Flavia about? Just what were the elder de Luces up to during World War II? And what do pheasant sandwiches have to do with it all?